Polygons and Polyhedra. Geometry. Transformations. Curves and Surfaces. Ray Tracing. Shading. Frame Buffer Techniques. Image Processing. Graphic Design. Utilities. 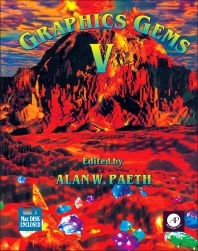 Graphics Gems V is the newest volume in The Graphics Gems Series.<$> It is intended to provide the graphics community with a set of practical tools for implementing new ideas and techniques, and to offer working solutions to real programming problems. These tools are written by a wide variety of graphics programmers from industry, academia, and research. The books in the series have become essential, time-saving tools for many programmers. Latest collection of graphics tips in The Graphics Gems Series written by the leading programmers in the field. Contains over 50 new gems displaying some of the most recent and innovative techniques in graphics programming. Includes gems covering ellipses, splines, Bezier curves, and ray tracing. Disk included containing source code from the gems available in both IBM and Macintosh versions. Graphics programmers, C programmers, graphics researchers, students, designers, and professionals interested in computer graphics. Also of interest to mathematicians, engineers, and scientists using C.
Alan W. Paeth is a professor of computer science at Okanagan University College in British Columbia. Previously, he was a research scientist specializing in VLSI technology at Xerox PARC. The principle architect of the first operational Pixelplanes silicon, he also fabricated the first Berkeley RISC and SGI Graphics Engine chips. His degrees span three calendar decades and three fields: Engineering, Mathematics, and Computer Science.